​Why was Lincoln and Boston a familiar surname in 18th Century New England? Boston, Massachusetts was settled by Puritans from the hamlet of Boston in Lincolnshire, England. The surname requirement arose from a great military victory by the Normans of France over the Saxons of Britain in 1066. Upon defeat of the Saxons, the Normans required Last names. Over the years, the preponderance of city or county names grew exponentially. For instance, if you do a genealogical survey of Boston or Lincoln names from 1500-1850 for Lincolnshire England the results will be two hundred and fifty Boston surnames. The results for Lincoln were similar. Records of births, deaths, census and church biblical records led to much duplication in today's online genealogical records. In contrast, sorting the same period for the surname Smith produced twenty-eight Smiths in Lincolnshire including the great explorer, John Smith, of Jamestown Virginia and New England, notoriety. The Smiths were typically artisans that dropped their occupation from their surname as in Goldsmith. Perhaps another attempt to be incognito. We did not find anyone named Pocahontas in Lincolnshire, though she spent several years visiting England. Pocahontas was a nickname meaning “little Playful One. ​[i] Her formal name was Matoaka meaning Bright Stream Between the Hills. [ii] Many slaves, Indian or African in Virginia, were given the first name of Pocahontas and their master’s surname further confused genealogical references. Though Amos was very busy at home, he participated in many independence events. He was identified in his roughly disguised Mohawk garb the night of the Boston Tea Party. His capentry skills were fully utilized opening the 342 wooden crates of tea. His father-in-law may well have monitored his every move as great care was taken to ensure the participants claimed no portion of the tea. He served in the artillery during the American Revolution. Amos advanced in the ranks of the militia to Lieutenant Colonel through nearly seven continuous years of service. [v] He saw military action at Bunker Hill, the great victory at Bennington Vermont over the English and Prussian mercenaries, service at Fort Independence, Vermont and served John Hancock during his term as governor. He marched in 1787, with Thomas Craft to put down Shay’s Rebellion. As a civilian, he was a master carpenter and a FreeMason. 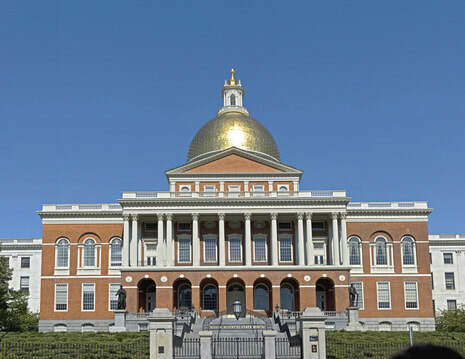 His most famous construction project was the current Massachusetts State House finished in 1798. The gold dome shown in the picture below was originally made of wood. It leaked. By 1802, Amos Lincoln solicited his father and brother-in-laws to fix the leaky dome. Paul Revere and his sons, Joseph Warren Revere and Paul Revere Jr. (the second of Paul’s children named as a result of the death of the first Paul Revere Jr.) adopted a solution that they first introduced to America: copper sheathing. Their experience making copper cannon, church bells and copper plating for this country’s warships served well to fasten two-thousand two-hundred copper plates to the dome. Legislation moved much faster after 1802. Amos did marry a third time in 1805 to Martha Howard Robb before he departed. Amos Lincoln lived a full life passing in January of 1829, at seventy-six. His brother, Levi Lincoln Sr., became Governor of Massachusetts. Levi Lincoln Jr. became a U.S. Congressman. A third brother was named Abraham Lincoln. You may conclude that Abraham Lincoln, Sixteenth President of the United States was an ancestor of Amos but that depends on the online family tree you read. The list of President Lincolns ancestors and predecessors is enormous. Each Lincoln can stand on their own. Amos is buried at Copps Hill in the North End of Boston, overlooking the route his father-in-law initially rowed to advise the countryside that the British are coming (actually “The regulars are out”). [ii] Price, Love and Hate in Jamestown, p. 66; Rountree, Helen C. (January 25, 2011). "Pocahontas (d. 1617)". Encyclopedia Virginia. Retrieved February 27, 2011.